Download the latest version of the Black Hole CPU benchmark! Let the beast run and benchmark your system in three different tests (Multithreaded, Singlethreaded & 4 Threaded) that will test your CPU to the very limit, and score you among hundreds of other systems that have tested. • Multithreaded will test your CPU's efficiency of running more than one thread without major system lag. The higher you score on this one, the more threads your CPU can handle with a comfortable speed. High multithreaded scores generally means you can render things faster. • 4 Threaded tests your CPU's performance in games, since most games currently run on 4 threads. •Singlethreaded evaluates how fast the CPU can handle a single, dedicated thread of processing. Since Multithreaded is arguably the most important and most future-proof test, it has a greater impact on the overall score results than the other individual tests. The program uses every instruction set enabled for 32bit systems, but sadly the instruction sets that are only active in 64bit systems are disabled in the benchmark. With our beta tests, we saw that Intel's 'Haswell' CPUs used the new AVX2 instruction to achieve abnormally high scores. We will enable 64bit when more programs support the new AVX2 instruction properly, but for now we think 32bit offers the most accurate real-world performance measurements at this point in time, so that's what we focus on. You can easily submit your scores from the link inside the program. Why not show the world that your CPU is at the top of the leaderboard?! These will be updated every week or day. • Chances of the 4 Threaded benchmark running only 2 threads greatly reduced. • Overall stability improved dramatically. • New program design for a more professional look (by Timmie). • New score submit options. • Different scaling protocols; Multithreaded now scales much higher than before. • New methods to evaluate the CPU's performance, especially in the 4-threaded test. • The benchmark is now exclusively 32bit (still works on 64bit machines, of course). • Very small chance of the 4 Threaded test to only run 2 threads. • No other known bugs currently - Report bugs on our website. • Black Hole Benchmark is designed to run on Windows XP and newer. • You must have .NET framework 2.1 or greater installed to run the benchmark. • System RAM speed and latency can have minor effects on a PC's final score. 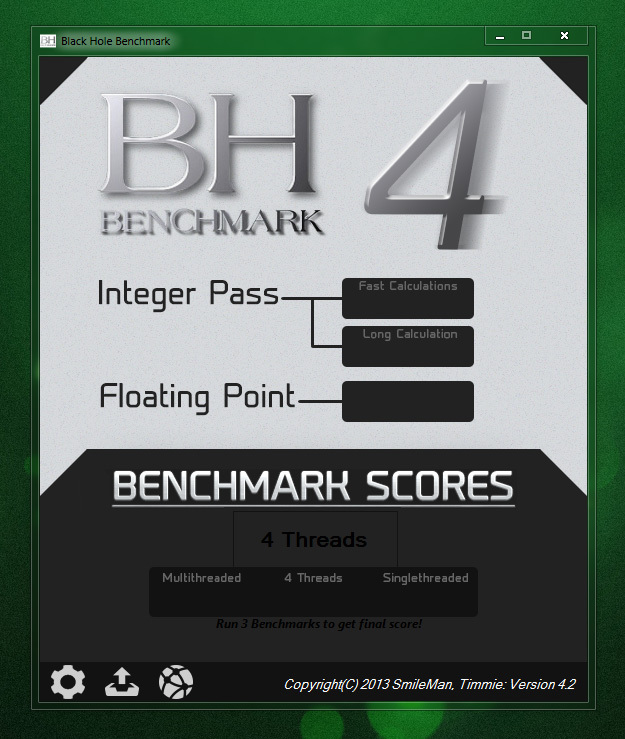 • The benchmark supports up to 34 threads.